Having a small forehead can make some people feel self-conscious about their face shape. Forehead size is definitely not something to be ashamed of, but if shifting focus away from this feature makes you feel more confident, there are certain looks and styles that can work in your favor. Baby or pixie-cut bangs are very cool. These are super short and lie at the very top of the forehead, about an inch or two from the hairline. Since they stop high up above the eyebrows, the forehead appears elongated, giving the illusion that you have more than you really do. This style works for both long and short hair and is so low-maintenance. Long side-swept bangs are another great optical illusion. Have your stylist cut bangs so that they start out shorter on one side, giving a peek of your forehead, getting longer across the face, and blending in with the rest of your hair on the other side. Style bangs with a blow-dryer or straightener and a smoothing serum to fight frizz. The side-swept style works with any hair length as well. If you're not a fan of bangs, try having hair all one length and pulling it back and away from the forehead and face. The pulled-back, sleek direction of the hair elongates the forehead. 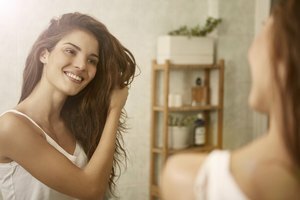 This look doesn't mean you have to wear a ponytail all the time; ou could style hair half-up, half-down, or tease the crown and comb and pin the front of your hair back. Men with small foreheads are not without hope either. Balance out a smaller forehead by styling hair thicker around the sides of the forehead, making hair less thick toward the jaw. This can mean doing thick, tousled locks in the front, with a shorter cut all over the back and sides, or longer hair at the hairline to be spiked up in the front. One look to avoid is long, blunt bangs. These actually appear relatively short on a person with a smaller forehead, and accentuate the size of the forehead.